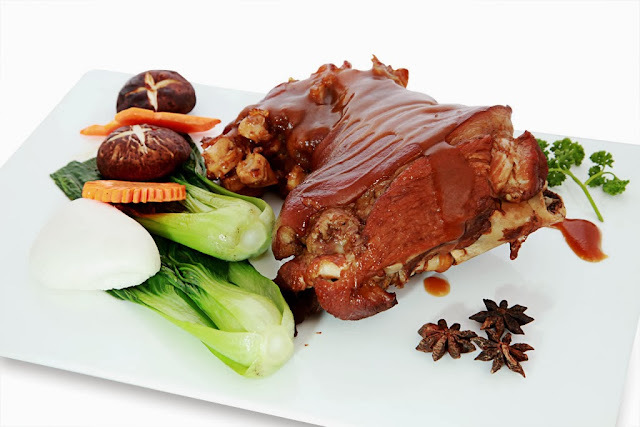 Pata Tim is a Chinese influenced pork leg dish that is slowly boiled to make the meat really tender. Most Filipino-Chinese restaurants have pata tim included in their chef's specials. This dish is fork-tender, fall-off-the-bone pork knuckles stewed on soy sauce, oyster sauce, and rice wine. Best eaten with rice or steamed bao buns.The sweet-tasting leftover sauce can be saved for use in a later meal to pour over steamed rice. 1. Heat the cooking oil on the wok. Use high heat. 2. Add half of the garlic. When it has browned, add the sugar and stir until they form clumps. 3. Put the pata in. Add the soy sauce and adjust according to taste. Mix all of the sauces to coat the pata well. 4. Put water to soften the pata. Change to low heat. Continue adding water until the pata is tender. This process takes around 3-4 hours. 5. Flip to other side at most 3 times, but take care that the pata will not break apart because it is now very soft. 6. Add the dried shrimp and cook for 10 minutes. Add the remaining half of the garlic. Turn off the flame. 7. Transfer to plate and serve.